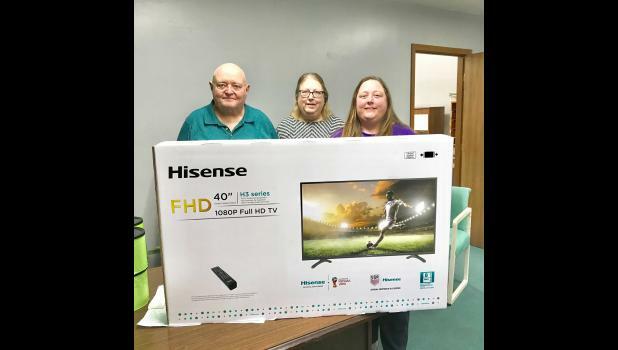 The winners of the Super Pick ‘Em Contest this year were Tom McLaughlin Sr. and his wife Evelyn of the Muscotah area shown in the photo above with their daughter Kathy McLaughlin and the 40-inch flat-screen TV that they won. Tom guessed that the score of Super Bowl 53 would be 9-3 with the New Eng- land Patriots winning and Evelyn guessed 12-6. These scores were the clos- est of the nearly 450 that were entered in the contest from the 24 participating businesses. No tiebreaker was needed. The actual score was Patriots 13, Los Angeles Rams 3. The McLaughlins filled out their entry forms at the Netawaka Family Fitness Center.